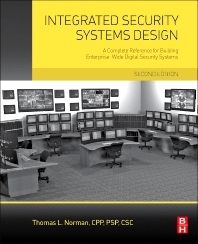 Integrated Security Systems Design, 2nd Edition, is recognized as the industry-leading book on the subject of security systems design. It explains how to design a fully integrated security system that ties together numerous subsystems into one complete, highly coordinated, and highly functional system. With a flexible and scalable enterprise-level system, security decision makers can make better informed decisions when incidents occur and improve their operational efficiencies in ways never before possible. The revised edition covers why designing an integrated security system is essential and how to lead the project to success. With new and expanded coverage of network architecture, physical security information management (PSIM) systems, camera technologies, and integration with the Business Information Management Network, Integrated Security Systems Design, 2nd Edition, shows how to improve a security program’s overall effectiveness while avoiding pitfalls and potential lawsuits. Guides the reader through the strategic, technical, and tactical aspects of the design process for a complete understanding of integrated digital security system design. Covers the fundamentals as well as special design considerations such as radio frequency systems and interfacing with legacy systems or emerging technologies. Demonstrates how to maximize safety while reducing liability and operating costs. Security directors, security managers, consultants, engineers, installation managers, security students, and other security professionals. Thomas L. Norman, CPP, PSP, CSC, is an internationally acclaimed security risk management and enterprise-class security system design consultant with experience in the United States, the Middle East, Europe, Africa, and Asia. Mr. Norman has experience in security designs for critical infrastructure including oil and gas terminals, lines, and distribution centers; mass transit and vehicle transportation systems including air security, rail, and marine facilities and systems; long-span suspension and truss bridges; and central banking, utility and financial facilities. Mr. Norman’s extended experience includes a large number of chemical, petrochemical, banking, government, corporate facilities, hospitality, healthcare, venues, and museums. Mr. Norman’s unique processes focus on identifying and securing the underlying causes of building system vulnerabilities, that is, business processes, technologies, and cultures that encourage the development of vulnerabilities to the detriment of the organization. As the author of the industry reference manual on integrated security system design, and with more than 35 years of experience in design, construction management and commissioning, Mr. Norman is considered one of the industry’s leading design consultants, worldwide, having contributed many industry design firsts including Video Pursuit and REAPs design concepts, among others. Mr. Norman has developed formulas and detailed processes that are used by the entire security industry to calculate the effectiveness of security programs and security program elements and also overall security program cost-effectiveness. Mr. Norman has authored four books: for the American Institute of Architects, "Security Planning and Design – A Guide for Architects and Building Owners"; "Integrated Security Systems Design" (Elsevier); "Risk Analysis and Security Countermeasures Selection" (CRC Press); and "Electronic Access Control" (Elsevier). His works have been quoted and referenced by organizations such as the Cato Institute, NBC, and Security Management.